I have been hearing it the past few days, the noise of dried leaves running all over the place, chased by the wind, not too hard but just enough to raise them a few inches off the ground and twirl them a wee bit. The dried leaves cackle in glee, like children being twirled high in the air by a favorite uncle. As soon as they fall back to the ground,they pretend to run to get away from the playful wind, secretly hoping the wind would once again give them a twirl. The wind, with time on its hand, obliges. What better way to pass the time than to make music by pushing the dried leaves this way and then that way? That is what I feel too, how beautiful is the music that the wind and the dried leaves create together! But it somehow seems the wrong season for it. Once upon a time I spent quite some time in a village called Ethanur in Palakkad. There were jack-fruit trees, mango trees, tamarind et al in and around the house. In late December, and early January, the wind blowing through the leaves created such a racket that one almost wanted to call out like a teacher in a classroom of unruly students,“Silence!” We are now almost into the second week of February, but the game continues here. Dried leaves are called ‘kariyila’ in Malayalam. And do you know what the bird above is called? Kariyila pakshi, pakshi being bird. So there you have it, a bird whose name literally translates to ‘dried leaf bird’. The description does fit, does it not? A bunch of them could be foraging among the dried leaves in the yard and still you won’t be able to spot them quickly enough, except by their chatter, and they do chatter a lot. It is only today that I heard their call, for the first time. There I was in bed, totally immersed in the book I was reading on Kindle when the dog who was lying next to me jumped up, startling me. She was quivering with excitement and had her face pointed towards the closed window. There was no mistaking; she was telling me there was someone at the window. 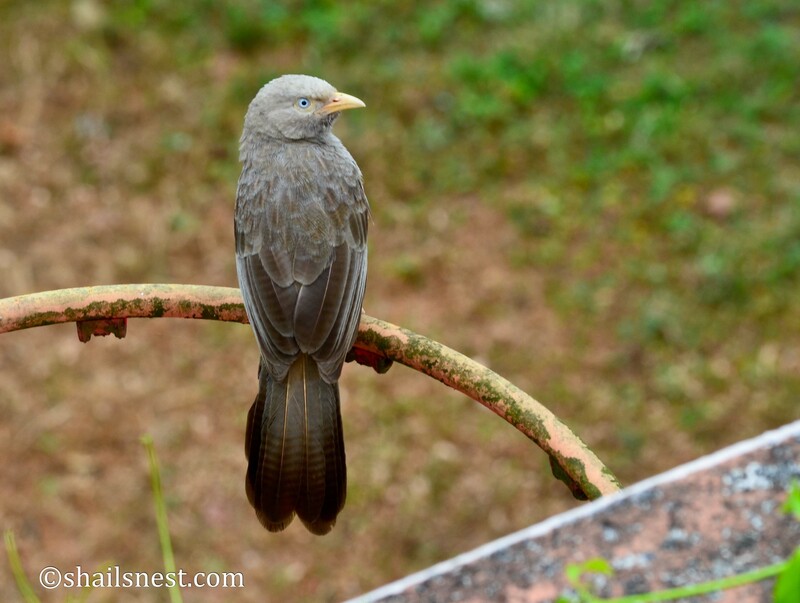 I saw nothing, but even as I watched a Yellow-billed Babbler flew, perched on the window and started pecking on the glass panel. Then I heard the calls. There were more of them! The enraged dog was by then prancing around and barking loudly. The scared bird promptly flew away. Sigh. I love birds, I love dogs. How to get them to love each other is the million dollar question. Anyway, I convinced the dog that we were going out on some important mission, but in the opposite direction. And when she self-importantly went to investigate, I unobtrusively withdrew, closed the door on her, quickly took my camera and hurried to the balcony to take a few shots. On another note, I have been watching TV the whole of today morning, a first for me. I have never ever followed an election as I have done this one in Delhi. Am I happy with the results? You bet I am. Positively thrilled. Me too. Super super super excited for Delhi! What a day it was! Kariyila pakshi? We call it in Tulau, ‘bejakre pakshi’ means the same! I am fed up with politics now and with Arnab also, but yesterday was different! Happy day! Engrossed and enjoying the election scramble!